Lone Wolf Taxidermy Studios offers a full line of Taxidermy and Tanning Services. We do custom mounts for the hunter and non-hunteralike. You don't have to be a hunter to enjoy beautiful animal creations in your home or business. 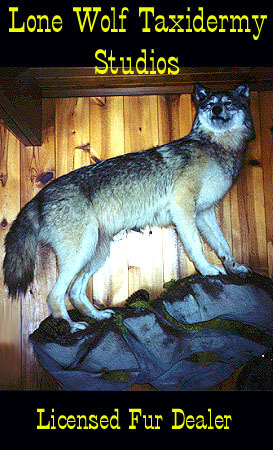 Lone Wolf Taxidermy specializes in mammals, fish, african, waterfowl, custom habitat, and shoulder and life-size mounts. We offer a full line of tanned and raw furs, hides, capes, and antlers. No job is too large or too small. Please sign our guest book.